SeaDream Yacht Club has a week-long sailing in December of this year that not only embraces one of its most popular Caribbean itineraries, it also includes Christmas Day at one of the best marinas in the islands, and a same-day visit to another island that was owned by an 18th century pirate whose brother had a wooden leg – and consequently the reputed inspiration for Robert Louis Stevenson's Treasure Island and its Long John Silver. SeaDream II that has just 56 staterooms and a crew of 95 officers and crew, sails on December 20th from historic San Juan with its narrow 16th-century cobblestoned shopping streets, and has next day at St John Island that's a national park and "the most virgin of the Virgin Islands." Another half dozen or so islands to follow include some with the finest beaches in the Caribbean and opportunities to use the yacht's watercraft, Marigot that's the region's most French in spirit with its cafés, pastry shops and luxury boutiques, and Gustavia in the French West Indies that SeaDream calls "it's most treasured destination in the Caribbean." And on Christmas Day morning there'll be Soper's Hole on Tortola Island for an optional 4WD safari or a swim with the dolphins, Norman Island on Christmas Day afternoon with its pirates and Treasure Island connections, Christmas Day night at Jost van Dyke Island, and Boxing Day still at Jost van Dyke with the opportunity for swimming, walking and a chance to try out its famed "Painkiller" at the legendary Soggy Dollar Bar. Plus Christmas Day dining aboard SeaDream II will be a grand slap-up affair – last year, for example, featuring turkey and all the trimmings. This year's sailing will end back in San Juan on December 27th; price starts from US$5091pp twin-share which includes SeaDream's award-winning cuisine, drinks with meals and from the bars, power and sail water-sports, use of SeaDream's onboard golf simulator and fitness centre, port charges and taxes, and even crew gratuities. 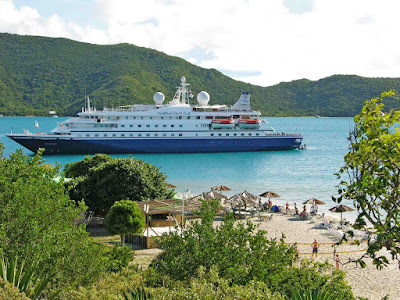 SEADREAM II's guests on this year's Christmas sailing will enjoy days ashore at balmy Caribbean islands like this.